The long-lost 'Theseus Ring,' a gold ring found in the Plaka district of Athens in the 1950s and generally dismissed as a fake, has been identified by Greek archaeologists as a genuine 15th century BC artifact, reports said Wednesday. 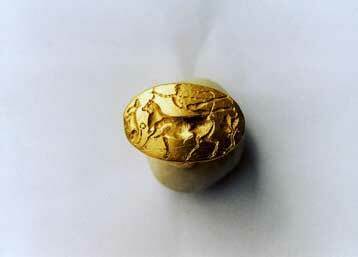 The Greek press had reported the discovery of a gold signet ring, with dimensions 2.7 x 1.8 cm dating from the Minoan period, and the National Archaeological Museum wanted to purchase it for 75,000 euros from the woman who owned it. There was a huge debate about its authenticity until a panel of experts from the Culture Ministry declared the piece to be genuine. The ring, which depicts a bull-leaping scene, is believed to come from the area of Anafiotika in the Athens ancient city centre of Plaka. The scene also includes a lion to the left and a tree to the right. According to ancient Greek mythology, Prince Theseus was the son of King Aegeus of Athens. During this period, the Minoans under the leadership of King Minos, who lived on the island of Crete, had a very strong navy and often attacked various Greek cities, including Athens. King Aegeus had an agreement with King Minos that if Minos would leave Athens in peace, Aegeus would send seven Athenian boys and seven Athenian girls to Crete every nine years, to be eaten by a monster that lived on Crete, the Minotaur. Determined to slay the monster, Theseus joined the children on the next voyage despite pleas from his father. King Aegeus made Theseus promise to change the sails on the boat from black to white if he managed to come home alive. After killing the Minotaur and sailing back towards Athens near Sounion, Theseus had forgotten to change the sail from black to white. When King Aegeus saw the black sail he thought Theseus was dead and jumped off a cliff, killing himself.